ONE DECEMBER EVENING, BROWNIE GROUNDHOG AND HER FRIEND THE FOX SHARED THEIR PICNIC WITH A NEW FRIEND, BUNNY. A THIN CRUST OF ICE RIMMED THE POND. "WHAT'S NEXT, BROWNIE?" ASKED FOX. "NAPTIME!" SAID BROWNIE. I'M GOING HOME TO SLEEP UNTIL SPRING." Brownie heads home, hangs her DO NOT DISTURB sign, and with instructions to Fox to have fun doing "wintry things," lies down for her long winter's nap. But Fox doesn't know what to do with himself without Brownie. When the snow begins to blow, he complains to Bunny that he's cold. Glancing back at her stubby tail, Bunny suggests that Fox wrap his bushy tail around his neck, but Fox has a better idea. Why not borrow Brownie's long red scarf? Bunny concurs. "NO FAIR. SHE ISN'T USING IT!" So Fox and Bunny head for Brownie's house, and although her warning sign gives them momentary pause, Fox finally pushes inside and starts rummaging through Brownie's closet. The racket arouses Brownie. "BEAKY WHITE. YAM SLIPPY. DOOBNY DIZZER!" SHE MUMBLES. "SHE WANTS ME TO LOOK IN HER DRESSER," INTERPRETS FOX. "BUMBLE CRUMPET LEMON SHEEP," GRUMBLES BROWNIE SLEEPILY. While he's there, Fox decides to take along some other things Brownie won't be needing for a while. He "borrows" her wheelbarrow and loads it up, with a fuzzy snowflake sweater, a trumpet, some decorations and a lovely wreath. Bunny get busy quickly decorating outside Brownie's door, and Fox nails the wreath to the door with her hammer. Suddenly Brownie's door flies open. "WHAT DO YOU THINK YOU'RE DOING?" SHE SAYS. "WELL, HI!" SAYS FOX. "YOU'RE UP EARLY! 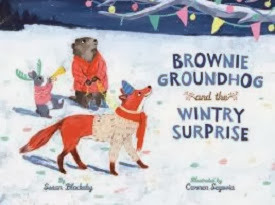 But as long as she's already up, Brownie decides take a break from her hibernation to enjoy Fox and Bunny's "wintry thing," a surprise party with decorations, trumpet music, and even pie, in Susan Blackaby's latest Brownie tale, Brownie Groundhog and the Wintry Surprise (Sterling Books, 2013). A not quite Groundhog's Day, not quite a Christmas story, this one makes the bleak midwinter merry in the best spirit of the season, with Carmen Segovia's merry and bright illustrations to get readers in a festive mood. Kirkus Reviews cuts to the chase: "Quirky, quiet, clever. Watch for more seasonal adventures from this tantalizing trio." For more midwinter merriment, pair this one with Blackaby's first book in this series,Brownie Groundhog and the February Fox.